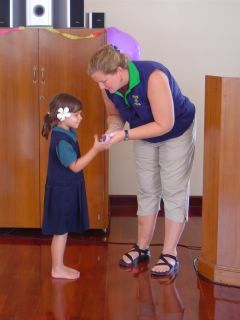 Emily receiving her kindergarten diploma. Today, Emily graduated from Kindergarten! We had a big party at the Consulate Residential compound, which was very nice. They sang songs, recited memory verses, then they received their diplomas. We ended up having a nice pot-luck lunch then a swim in the pool.